It may be time to pull out the dead, scary looking things formerly called plants that are lingering by the front door. I have one in a half whiskey barrel that startles me every time I walk by, it’s that ugly. Since temperatures are creeping up I may take action and create a container like the one above. That was my spring pot last year. That unassuming yellow pansy was the champion. It kept blooming throughout spring, all summer and into the fall, cascading down the side into a billowy, buttery profusion. I had meant to remove it in the summer, but it just kept getting better looking as the seasons progressed (we should be that lucky). 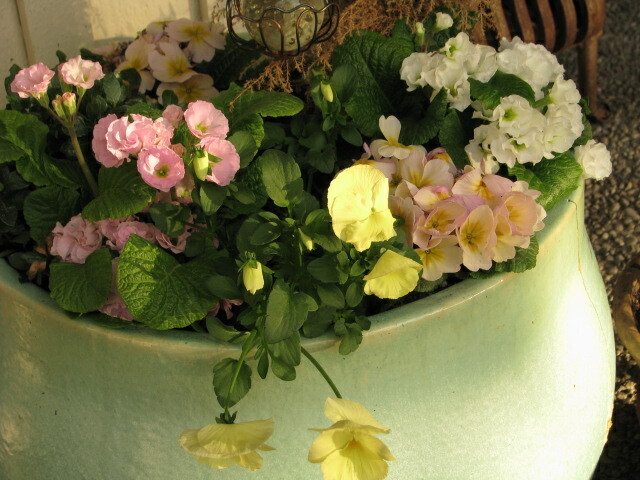 I really like the double primroses, as they resemble frilly little roses, so delicate in their pastel shades. A lemon-green Monterey cypress ‘Wilma goldcrest’ would really set the annuals off as the centerpiece. So get down to the nursery (yes, they are still in business) and start shopping for some spring-is-almost-here color for your containers. Replace the dead with some dazzle.